1 The white settlers in the Northwest Territory breathed a sigh of relief. 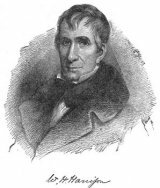 The Battle of Tippecanoe had crushed the native alliance and made life on the frontier much easier. The settlers cheered when the U.S. went to war with Britain in June of 1812. Surely U.S. forces could march into Canada and easily take the poorly defended British colony. 2 The settlers didn't like Britain on their doorstep. Tecumseh and other natives on the frontier were now allied with Britain. What was to stop British troops and their native friends from massing above the border, marching down, and overrunning U.S. territory? Besides that, think of the gains to be made when Canada fell into U.S. hands. Millions of acres of forest and farm land, rich natural resources, rivers, and all sorts of goodies that made up the vast regions of Canada-all ripe for the picking! 3 Unfortunately, the pickings might not be as easy as they seemed. In one of the first confrontations of the war, U.S. General Hull had so bungled his part of the invasion of Canada that he had surrendered Detroit without firing a shot. All of his considerable store of weapons and supplies were now in the hands of the British. When Detroit fell, the rest of the Great Lakes region soon followed. The grand U.S. invasion of Canada ended up with the Northwest Territory in British hands. Settlers began to think that they should brush up on the words to the song "Rule Britannia"!